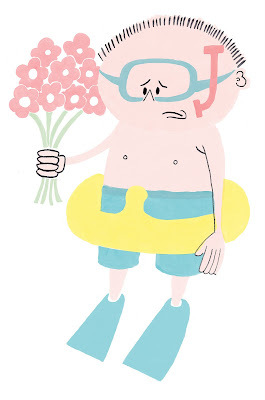 A while ago now, we were asked to pick an editorial and come up with a new illustration to accompany it. 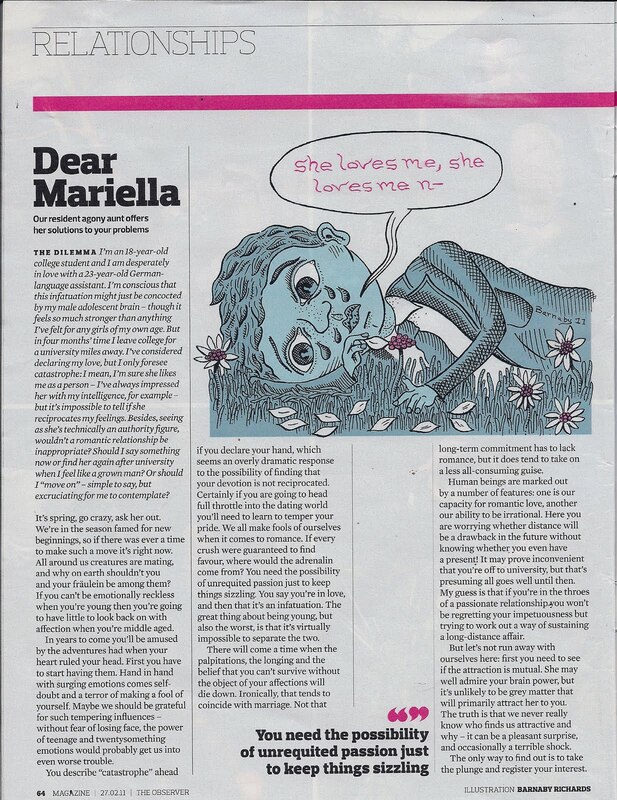 I chose a piece called‘Relationships’ by Mariella Frostrup from 'The Observer Magazine'. The article is a 'Q and A' piece in the style of an 'Agony Aunt' column. 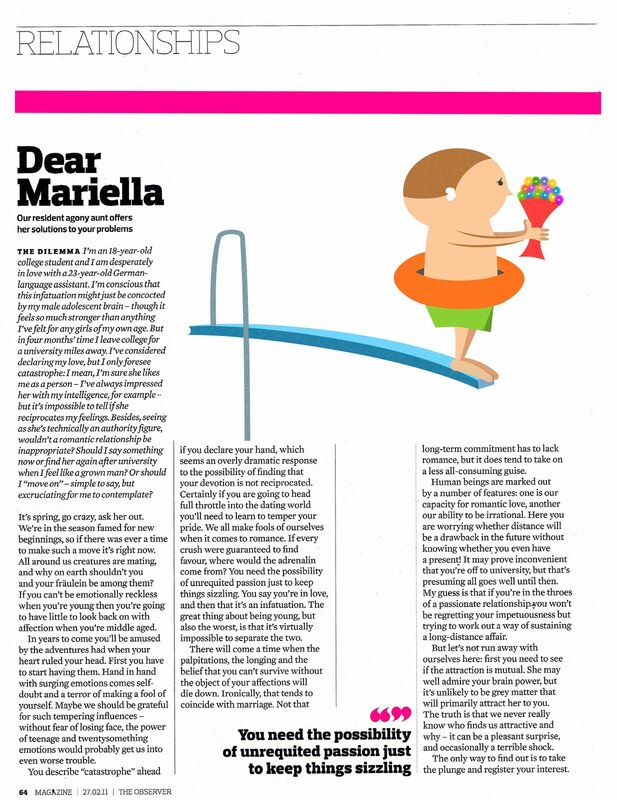 In the article a young and confused student writes in asking for Mariella's advice. His problem is that he has recently become infatuated with his 23 year old 'German language assistant'. 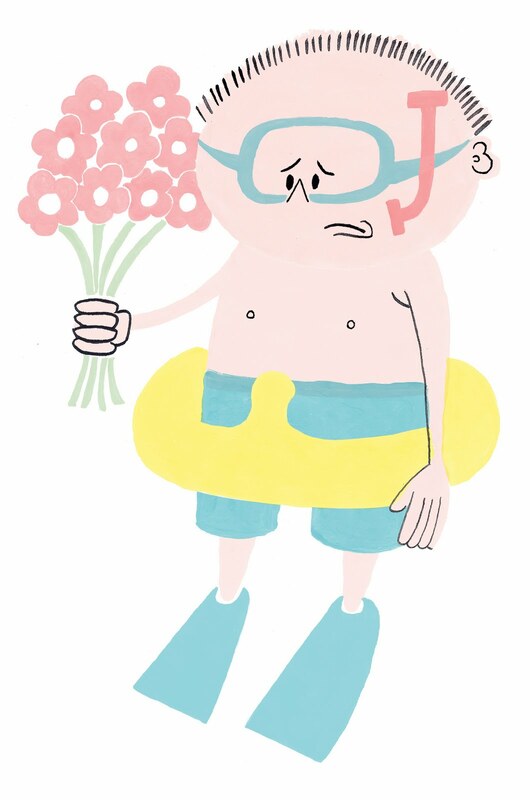 He is uncertain whether or not h should make his feeling known to her, he has to decide quickly though because time is against him and in four months time he is to leave to go to college. 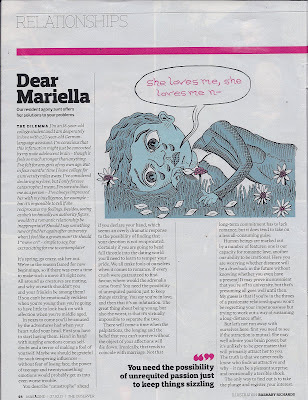 Mariella responds by telling that what he really ought to do is throw caution to the wind, follow his heart and go for it. 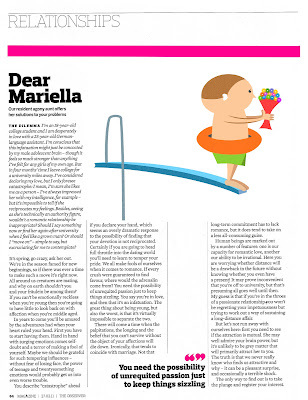 When I read the article it occurred to me that most of the text is taken up with Mariella's answer and that the recurring theme is the notion of being brave and 'taking the plunge'. 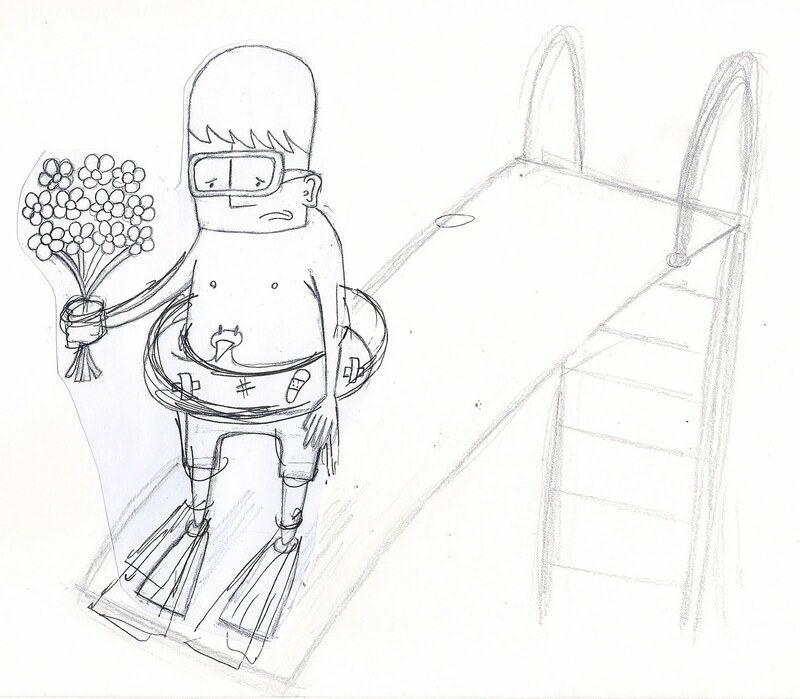 So I decided that I would show a character cautiously preparing to take this leap into the unknown. 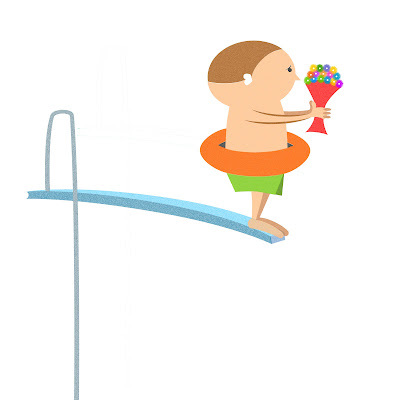 After much discussion with my tutor and colleagues about possible ideas, I came upon the notion of the character preparing to jump from a diving board, perhaps grasping a bouquet of flowers to further illustrate the concept of uncertain romance. 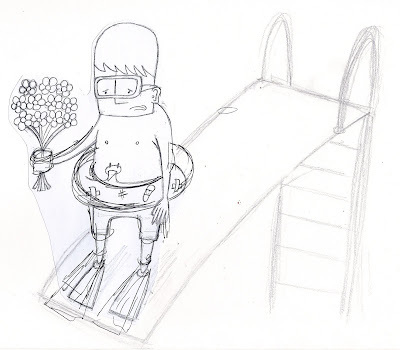 So, now all that remained was for me to create the illustration and unfortunately this is where my problems began. I spent the best part of a week struggling with a complicated image that simply wasn't working. And so after speaking to my tutor about it I decided to start again. It was actually a big relief when I admitted defeat and went about creating the image in a different and simpler way. Although I can't deny that my failure to successfully create the illustration the first time around had a considerable knock on my confidence. After all that I eventually came up with an illustration that I am happy with as I feel it successfully reflects both the mood of the article and my 'style'. I did consider only posting this successful outcome, but now think its important to show the images that didn't work, as they ultimately lead to the final piece.